Luke Crabtree takes a swing for the Washington C.H. All-Stars against Fairborn. Evan Lynch leads off second base for the Washington C.H. All-Stars against Fairborn. FAIRBORN — In what would be the first of two games against Fairborn, the Washington C.H. 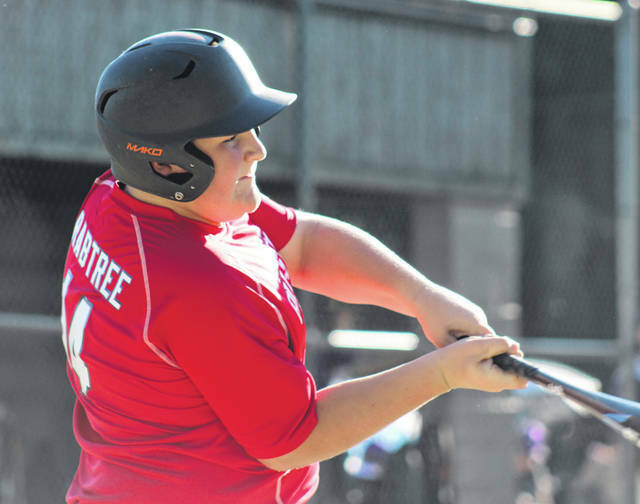 12-year-old all-stars defeated the home team Saturday, 11-0. The win advanced Washington C.H. to the championship game of District 8 on Sunday. In Saturday’s game, Brady Armstrong pitched a perfect game with no hits and no walks over four innings for Washington C.H. Washington C.H. had eight hits, led by Evan Lynch who went 3 for 3 with three runs batted in and two runs scored. The Washington C.H. all-stars scored five runs in the first and six in the third. In the top of the first, John Wall led off with a walk and moved to second on a passed ball. Justin Robinson grounded out, moving Wall to third. Armstrong had an infield hit and Isaiah Haithcock singled to score Wall. Coleden May followed with a double to right-center that scored Armstrong and Haithcock. Lynch had an infield hit that scored May to make it 4-0. Hunter Allen reached on an error and Bryce Yeazel had a fielder’s choice that scored Lynch. In the second inning for Washington C.H., Haithcock had a two-out double, but was stranded. Lynch led off the top of the third with a bunt single. One out later, Yeazel singled and Will Miller was then hit by a pitch, loading the bases. Wall grounded out, scoring Lynch. Robinson walked, forcing in Yeazel. With the score 7-0, Fairborn made a pitching change. Miller scored on a wild pitch and Armstrong walked to re-load the bases. With the second out recorded, May walked, scoring Wall. Lynch then singled, scoring Armstrong and Robinson for what turned out to be the final tally, 11-0. Corbin Melvin drew a two-out walk in the top of the fourth for Washington C.H., but he was stranded on base. Armstrong retired the side in order in the fourth, facing the minimum of 12 Fairborn batters. The win propelled Washington C.H. to the championship game for the District 8 title, Sunday afternoon against Fairborn. Offensively for Washington C.H. : John Wall, 0-3, 1 bb, 1 rbi, 2 runs; Justin Robinson, 0-2, 1 bb, 1 rbi, 1 run; Brady Armstron, 1-2, 2 runs, 1 bb; Isaiah Haithcock, 2-3, 1 2b, 1 run, 1 rbi; Coleden May, 1-2, 1 2b, 3 rbi, 1 run, 1 bb; Evan Lynch, 3-3, 3 rbi, 2 runs; Hunter Allen, 0-2, roe; Bryce Yeazel, 1-2, 1 rbi, 1 run; Will Miller, 1 bb, hbp, 1 run; Hunter Hinkley, 0-1; Corbin Melvin, 1 bb.